A classic Christmas traditions for many is to read The Night Before Christmas on Christmas Eve with your family. 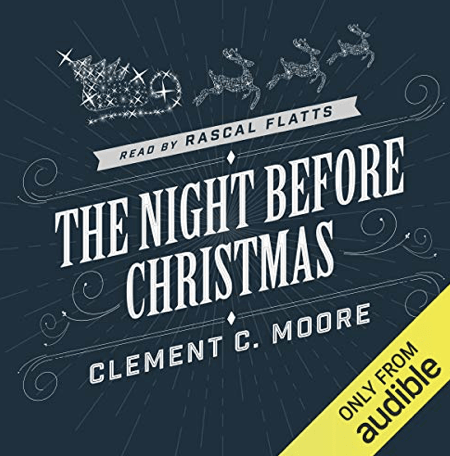 However, this year, you could change up that tradition a bit with a fun twist as there is a Free Audible Book download for The Night Before Christmas read by Rascal Flatts. You can head on over to Audible to find the Rascal Flatts “The Night Before Christmas” download or say “Alexa, read “The Night Before Christmas by Rascal Flatts” to have it play on your device. If you want to try out Audible, don’t forget there is a FREE Audible Trial happening right now so you can test it out for 30 days – a great time to try it if you have any holiday road trips or plane travel happening over Christmas break! With the free 30 day trial, you will get 2 FREE audiobooks to listen to as well! Let us know your favorite books on Audible!